Why is my male GSD so timid and scared of everything? I have a 9 month old GSD that is in the house, gets taken on walks, in the car for trips to petsmart and open fields (with no other dogs there) where he can run and play, dog parks, the beach, and yet he wants nothing to do with anyone other my immediate family. I'm not sure if it has to do with his age or what, but he is so skittish around new people. He doesn't bark or growl, but just walks away from them and if they come after him he will actually run with his tail between his legs. I got him when he was 4 months old and he has never been hit or had anything traumatic done to him. It is like he has two personalities. One at home - playful, cuddly, funny, assertive, outgoing and another when others are around. He doesn't EVER bark or growl. I don't understand. I try to put him in new situations to socialize, like take him downtown but he just doesn't change his behavior. It sounds as though you're doing the right things. You mentioned that you got him when he was already 4 months old and I suspect that that has much to do with the fact of his being shy around other people and animals, etc. Not knowing his background at around 3 weeks of age until you got him it sounds to me as if he was not properly socialized as a very young puppy with other people, animals and things. puppies, especially around 3 to 5 weeks or so of age are often very interested in new people and things and this is the perfect time to subject them to loads of new stimuli - like new people, animals and places and objects. This makes them much more willing to be around other things as they mature - for one thing, because they already have had many experiences with new things. Now very quickly after this period of time has emerged they will enter into a fear period - usually around about the age of 6 weeks or so. And when this happens, it is called the fear period by many, for some puppies it may be so strong that it completely overcomes their desire to meet new people, things, etc and even cause them to be so fearful that they are basically just the opposite of their earlier curious selves. Early, early socialization is so important for this very reason. And in many dogs/puppies, if a puppy is not exposed to goats, other dogs, cats, horses, small children, etc before it reaches around 12 weeks of age, it is likely it will never accept them easily. And this may be the issue at the heart of your GSDs issues with new things. Or it may be that your puppy just needs much more exposure and more work in this area. Who can say for for without knowing the entire situation? Temperaments vary from dog to dog and yours just may require a lot more work and patience in this area. So if I were you I would keep doing what you're doing. Don't coddle the puppy - be confident and sure of yourself and teach your puppy to be the same. If you baby it when it balks at new things you will only make it worse. Just take it slow and be patient. Sign yourself and your GSD puppy up for as many training classes as you can and continue the socialization exercises - build its confidence and you will build a better GSD and make its future (and yours too) so much happier. Good luck! Comments for Why is my male GSD so timid and scared of everything? She has broke her leg running away from a cat ! 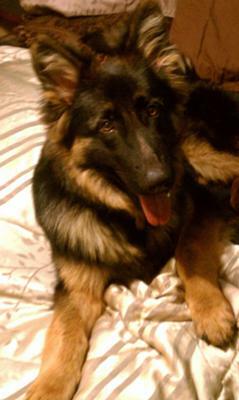 My male GSD will be 3 in 3 months. He has random fear when taking walks during the evening and early hours. He never tucks his tail but will pull me until we get home. At 85 lbs it is impossible to make him sit and relax when he goes through this. He is still intact and I'm wondering if it may be hormonal. Any ideas how to resolve this or what the cause may be? Bobby is my 5th GSD. He is the only boy I have eve had. He is such a good boy as long as he is with mommy, (me). My husband can't get this dog to obey any command. If my husband gets close, Bobby pees. If my adult son comes over my Bobby pees. Bobby loves my daughter, all of my grandkids. Basically any female. He is just so afraid of males. We have tried everything and anything. His behavior in our home is perfect. My husband and I are in our early 60's and we also have a 10 lb Yorkie Poo that rules the roost. I can talk to Bobby about anything and he listens and understands and obeys. He loves my husband if he is laying in his bed or sitting on the sofa. He even lays his head on his lap. When my husband tries to put his collar on or tries to get him to go outside, he pees. Never pees around me. Never does anything wrong. Once in awhile if he is in the front yard and we have an acre, if there are walkers with dogs he does bark but he is very timid, non-barker majority of the time. He is polite. He tells me he has to go outside by just doing one small cry thats it. He has learned everything I have tried to teach him. I know he is smart, I taught him how to open my bedroom door today. What is wrong with him. He gets along perfect with my little dogs and if she tries to run off outside, I just say Bobby go get Bella and he will try to fetch her. He is timid and scarred around men. What shall I do????? I rescued my White GSD about 11 months ago and the first time I walked up to him he peed all over himself. He was EXTREMELY shy of men and new things in general and his hackles went up at the drop of a hat. Unlike my last shepherd which was very confident, I cannot raise my voice to this one...it just scares him more and makes him more prone to distrust. I found that he will respond to my commands given in a normal voice or even a whisper, and really well to hand signals. Like you I had my dog off leash a lot hiking and playing frisbee, maybe a little too much. In new situations (even indoors)I keep him on the leash, and if he gets nervous I ask him to sit next to me but DO NOT coddle him, just completely ignore him...otherwise you are rewarding an undesirable behavior. Now when he is off leash he looks to me for cues and I remain as calm and uninterested as I can muster up. On trails I call him back to me whenever a person or dog is coming, which reinforces his looking to me for cues. I started taking him everywhere, in small doses. I'd take him to a quiet outdoor cafe where people and cars go by, then bring him home to relax. He still doesn't like crowds so I don't bring him to crowded places. Over time he has shown drastic improvements in what he will tolerate. To improve his fear of people I started taking him to the dog park. I know that sounds weird, but it worked! He is so engaged with other dogs he barely notices the people! At first I'd watch him closely to make sure he wasn't honing in on someone who made him nervous (and would remove him if he was), but now he walks up to total strangers to be pet. Keep in mind I did not bring him to the dog park until I had socialized him for months. Lastly, I learned to trust him. This was hard, because I knew he was capable of biting someone if under extreme distress. But I knew that if I wanted him to look to me for cues on behavior, I would have to remain calm and not get nervous when he looks wary of a stranger...because that's the nature of shepherds. Of course, I still grab his collar if someone comes to my door because he sounds like he's going to eat them! Hope some of this helps, and maybe you have already figured out ways to calm your dog down to help him enjoy life as dogs should! Some of it may be poor breeding, but if it's lack of socialization I wanted to say that at least I have had success with my dog and so believe there is hope for yours! First, he is a beautiful GSD. He is still a pup and hopefully he will come out of his "shell". Take care and good luck.